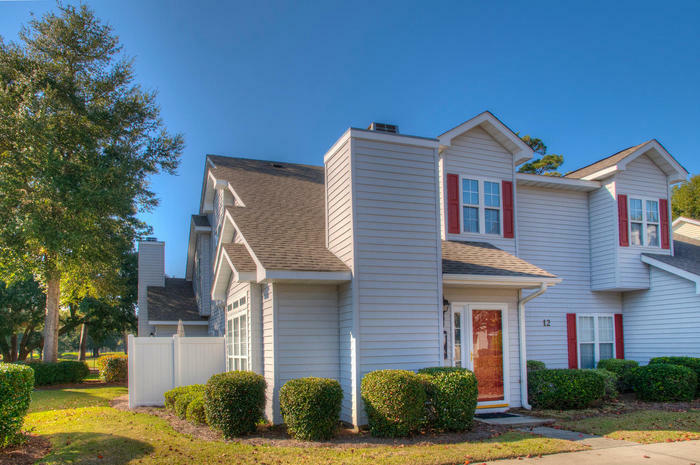 Park near the front door of your North Myrtle Beach vacation rental and easily carry in luggage, groceries and treasures from your shopping excursion. Likewise, it is easy to get to the beachfront from these spacious accommodations. Just put your favorite book, sunscreen, snack and beach towel into your beach tote and you are on your way. Don’t forget your camera because the white sandy beaches are quite picturesque and if you happen to see a dolphin or two swimming down the coastline you will want to grab your camera and get a picture. The sparkling blue swimming pool and the clubhouse are in the middle of this North Myrtle Beach neighborhood. Walk to the pool deck and lounge in the sunshine. Hop in the swimming pool when the temperature gets a little too hot. Start your North Myrtle Beach vacation day with an invigorating swim in the pool. After playing 18 holes of golf on a nearby North Myrtle Beach golf course, hop into the swimming pool again. It is such a refreshing way to relax and get a suntan at the same time. Just a few blocks down 20th Avenue North and you will be right at the white sandy beaches and the crashing waves of the Atlantic Ocean. Find a spot for your family on the beachfront and spread out your beach towels and unfold your beach chairs. Play games in the sand and build sand castles with the kids. At low tide the beach is quite wide and there are many more opportunities to find seashells. At high tide the waves get bigger and are fun to surf on a body board. Because the beach is so closely located to the spacious and beautiful condominiums at Fairway Oaks, you can set your alarm and get up early enough that you can walk to the beach from your accommodations and watch an early morning sunrise. The sun comes up over the Atlantic Ocean and the array of colors it casts on the Atlantic is phenomenal. Indulge in this luxury during your North Myrtle Beach vacation and even spend a few minutes looking for treasures that washed ashore during the night. Be the first to spot sand dollars in the early morning light and see if that doesn’t make you feel rich. When you are in North Myrtle Beach for a relaxing vacation at Fairway Oaks, you will be in close proximity to many North Myrtle Beach amusements and Myrtle Beach attractions. Myrtle Beach golf courses are popular with all levels of golf aficionados. There are more than 100 Myrtle Beach area golf courses. Take time to enjoy the local scenery, get back to nature and get in some exercise during a game or two of North Myrtle Beach golf. Making tee times for a North Myrtle Beach golf course is easy. If you prefer activities other than sports, you are still in the right place. The Cherry Grove Fishing Pier is just a few blocks away from Fairway Oaks and this attraction welcomes everyone. While it is from this pier that some record catches have been made, some people just like to walk on the pier for a change of scenery. Looking back at the North Myrtle Beach coastline from the vantage point of a fishing pier puts a whole new perspective on things. Water sports are big in North Myrtle Beach area and include parasailing, banana boat rides and Sea Doo rentals. Live entertainment theatres, amusement rides and even water slides are found throughout the North Myrtle Beach area, in addition to shopping, dining and deep-sea fishing. Elliott Beach Rentals is not affiliated with onsite management or the HOA of Fairway Oaks.